Hello! I am still alive. I have not been around the blog much lately because I have been busy with work and other things. Maybe things will settle down soon and I will have the time to post some more information and photos about native plants in my garden. I received an email earlier this week from Emily Neiman at Native American Seed. We corresponded a couple of times in the past. This week she wrote to say that her dad and brother (Bill and Weston) were presenting a Water Conservation Symposium in Flower Mound. Emily said she was looking for "some model native landscape examples" from north Texas and wanted to know if they could include photos from my blog. Of course I agreed, but it was not until just now that I realized that she may have been referring to photos of other native landscapes that I posted on the blog and not necessarily my own landscape. It looks like an interesting event and worth attending if you can. It is this Saturday, February 20 at the Flower Mound Public Library on Broadmoor Lane. See the flyer below for more information. Before opening Native American Seed in Junction, Bill Neiman had a native plant nursery, Neiman Environments, in Flower Mound. I grew up in nearby in Highland Village and I remember going there with my mom to shop for plants. I don't think we ever came home with any native plants. That was a few years before I was familiar with landscaping with native plants and native plants rarely look good in nursery pot, so we stuck to the traditional landscape plants. I do remember asking Bill Neiman a question about a plant and receiving much more information in return than I expected (or, as a young kid, wanted). I don't remember the plant or the question, but I do remember the passion for plants in his response. 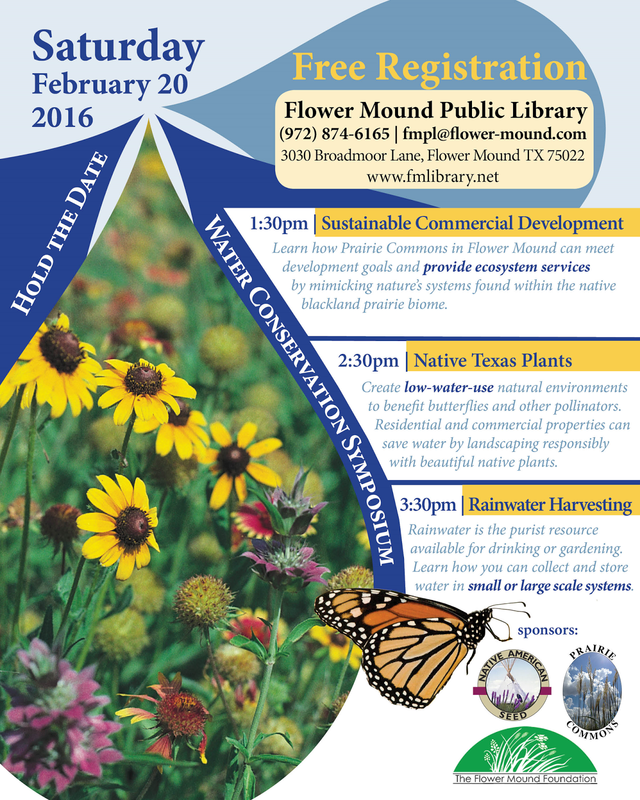 For a preview of the interesting information about native plants that you will hear at the symposium, below is an interview with Bill Neiman on Central Texas Gardener from 2013. After all these years, he has not lost his passion. In closing, here are a few photos of the native plants and grasses in my garden. I need to time my photo taking a little better to take full advantage of the sunrise and sunset on the grasses and I better do it soon. I will cut all of the plants back to the ground in the next week or two.